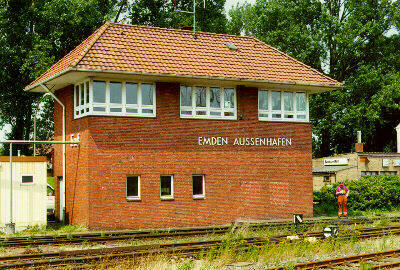 Welcome to our pages concerning information on German signalboxes and railway signalling. We are sorry, but at this time most of our pages are only available in German. In the future we will translate more pages into English but this will take a little time. You might use Google to translate our website. The results often sound somewhat funny but it should be enough to unterstand the meaning (and of course: the pictures do not need a translation). Also take a look at the link-section where you can find other pages in English, e.g. Wolfgang Meyenberg's website on German railway signalling. Nevertheless we wish you a pleasant visit to this place. We hope that you will find the information you have been looking for. Before leaving please sign our guestbook. Basics: Which safety systems are necessary to guarantee an accident-free running of trains? Why do you need signalboxes? Which functions do they fulfill? You will find the basics on German railway safety principles here. A good introduction to German block and interlocking principles can be found here. Types of signal boxes: There are mechanical and electromecanical signalboxes as well as signalboxes operated by relais or microcomputers. But there is not only one mecanical signalbox-type. There have been many manufacturers like AEG, Bruchsal, Jüdel and Siemens (just to mention a few). There are also regional differences, e.g. the levers are at position "bottom" for closed signals in Saxonia while the other German railway companies preferred the position "top". This section introduces the different manufacturers and shows the characteristics of each signalbox-type. Register: A collection of signalboxes in Germany sorted by alphabetical order. Pictures: The register is nice, but what if it does not mean anything to you? Click on this link to visit some signalboxes from inside. Signalling systems: At this time there are five different signalling systems in Germany. Some of them are only valid on suburban trains (Berlin and Hamburg) or as an experiment (the Sk-system between Augsburg and Donauwörth). In addition there are signalling systems at industrial railways (e.g. brown coal exploitation in the former East Germany), subways and tramways. We have put information together here on the most important signalling systems. Articles: Essays and texts on special topics. Curiosities: Pictures of rare and nonexistent signals, signalling experiments and other funny stuff. Literature: Present and historical books on signalboxes and signalling systems. Contact: Our mailaddresses, the guestbook, a mailinglist and the Stellwerke-webring. About this website: Why we created these pages. Navigation: Just click on one of the links. The blue arrow marks the current position. To go back to the homepage select "Startseite".